In a tweet the group posted at the end of last year, it called Israel a “steaming pile of sewage.” The group has also drawn criticism for disruptive activities, including protests in Trafalgar Square and events aimed at satirizing more established Jewish groups. The group does not seem to take itself seriously. Its website states: “Probably you’ve clicked here because you’re rather baffled by the rest of the site.” There is also a joking reference about a “Book of Jewdas,” supposedly discovered in the back of a kebab shop in the Dalston section of East London. 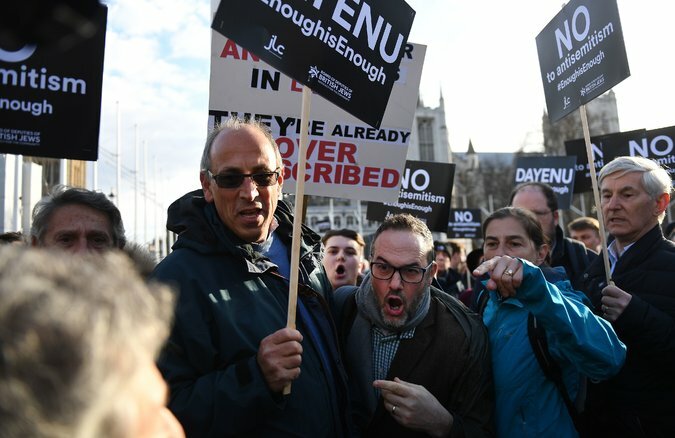 Members of London’s Jewish community — including some who support Mr. Corbyn and others who oppose him — clashed at a protest outside Parliament last week. East London is known today as a hipster haven, a hub of public housing and a home to tech and design companies. But like the Lower East Side of Manhattan, it was also traditionally the home of numerous immigrant communities, including many Eastern European Jews who moved to Britain in the 19th and 20th centuries. The Seder was held in an Anglican Church known for its ecumenical approach; the meal was vegan. But the group’s use of satire has antagonized other Jewish organizations in Britain. In 2006, four Jewdas members were arrested on charges of “handing out anti-Semitic literature at a celebration in Trafalgar Square,” The Jerusalem Post reported. In 2009, members of Jewdas sent out spoof emails in the name of the Board of Deputies, a leading Jewish organization, telling supporters that a scheduled rally had been called off. And in 2015, three Jewdas members were thrown out of a conference organized by We Believe in Israel, a pro-Israel grass-roots movement in Britain, for distributing anti-Israel leaflets. Members of the group have previously taken part in protests against Israeli attacks on Gaza, but have also helped organize protests against the British government’s austerity program and in favor of migrants’ rights. The controversy over the Seder with Mr. Corbyn comes amid growing criticism of anti-Semitism in the Labour Party and a broader debate over whether Israel should face an international boycott, and even economic sanctions, because of its policies toward Palestinians and the occupied Palestinian territories. In a blog post about the issue, Jewdas blamed the mess on several mainstream Jewish organizations and politicians.